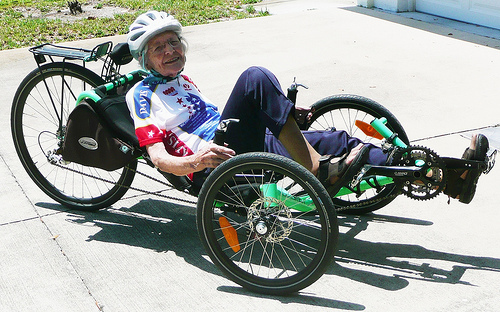 Phyllis Harmon is the grande dame of American bicycling. She helped create and nurture a number of clubs and advocacy organizations, including the League of American Wheelmen, now called the League of American Bicyclists. During her 66 years with the league, she wore many hats, including editor of the league’s magazine. In 2005, the league identified Harmon as one of the 25 people who changed bicycling in America. A longtime Chicagoland resident, Harmon also helped found the Evanston Bike Club and the Wheeling Wheelmen. When the Active Transportation Alliance formed in 1985 (then called the Chicagoland Bicycle Federation), Harmon and Schwinn’s Keith Kingbay, another legend in the national bike advocacy community, used their league experience to mentor the fledgling organization. They provided advice on how to structure the new organization, publish a newsletter and get the word out about bicycle laws and safety issues. The Chicagoland Bicycle Federation inducted Harmon into the CBF Hall of Fame in 2006, and in November 2010 she became the oldest living inductee of the U.S. Bicycling Hall of Fame. Now 94, Harmon still leads a very active life. Last year I had the pleasure of chatting with her over the phone on behalf of Active Trans on the eve of the organization’s 25th anniversary. It’s quite a feather in your cap that you were chosen for the U.S. Bicycling Hall of Fame. Yeah, it was like the cherry on the sundae–it topped everything off. It’s been 80 years of bicycling and then 72 years of bicycle advocacy: being executive vice-president and treasurer and historian and editor and all of those titles for the league. Can you describe your early with work with the League of American Wheelmen? Riders would come from all over Chicago to Evanston to have a night ride on Tuesday nights and a day ride on Sunday. Someone from the league showed up one night and asked if we wanted to start the first chapter of the League of American Wheelmen. We didn’t know who they were until we found out the history of it. And we needed three clubs to form a council, so we got the Rambler Cycle Club, the Oak Park Cycle Club and our club [the Evanston Bicycle Touring Club] and we were the first council in the League. After the war, the cars were getting wider and the roads were starting to feel narrow. You took your life into your own hands if you went out on a bike ride. Bicycling just seemed to stop for a while. If you had a large group of bicyclists on a ride you’d have to ride single file, and if a car was coming you’d have to get off the road because if a car was coming from ahead of you, the car behind you couldn’t pass you. It wasn’t any fun anymore so the league was inactive for a long time. In 1964 the government notified the league they were going to take over their bank account because of inactivity. So the president of the league decided to have a banquet and invite all the members: 250 people showed up. And bike riders talk. So in 1965 we decided to start the league up again. It became a national organization in 1966. [Now] they’ve got about 30,000 members. Tell me about your involvement in the early days of the Chicagoland Bicycle Federation. I was the vice-president of the League of American Bicyclists when the Chicagoland Bicycle Federation was forming. Keith Kingbay and I went to several of the meetings and helped them get organized. I was impressed to come to Chicago [for the CBF Hall of Fame induction] and see how the Chicagoland Bicycle Federation had grown from only 25 members when we first got started. How do feel about the way things have developed with the CBF/Active Transportation Alliance over the last 25 years? I was very impressed. I had no idea it had grown so fast. When I went to the awards ceremony that night, I was just amazed by how big it had grown. Is that the last time you were in Chicago? No, I go every September for the start of the Wheeling Wheelmen’s Harmon 100 century ride. I moved to Wheeling in 1969 and in 1970 I started the Wheeling Wheelmen Bicycle Club. That September we held our first century – we called it the Wheeling 100 at the time. It’s continued every year since then, usually on the Sunday after Labor Day. I lived in the Chicago area for 80-some years so I’ve got lots of family and friends up there. I spend two or three weeks there. I drive up to Chicago and then I drive down to Texas to see my daughter there and then I have to fly to Arizona to visit my other daughter because she sends me a ticket. As Active Trans completes 25 years, do you have any advice for where the organization should go in the future? Just keep on publicizing the advantages of commuting by bicycle and stress the importance of safety. For example, I once wrote an article that was a whole page of reasons for riding on the right. All those safety things you’ve got to make a point of suggesting because they’re so important. [It’s] so important to get people interested [with events], because if you focus too much on the business side people don’t keep renewing their memberships. But if you create camaraderie, which to me is the reason I ride a bicycle, that keeps your organization lively and makes people feel like they really belong to the organization. But anyway, I’m very proud of what you’ve all done. It’s been great.